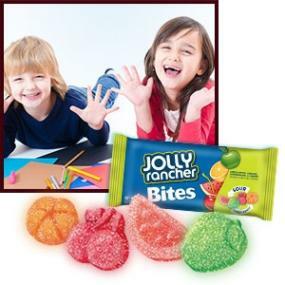 Jolly Rancher Screaming Sours Soft & Chewy Candy is a sweet and sour snack that’s sure to brighten anyone’s day. But don’t give them all away—this delicious candy will leave your taste buds screaming for more! Let loved ones know you’re thinking about them by slipping a package of candy in their jacket pocket. In 1949, Bill and Dorothy Harmsen started the Jolly Rancher Candy Company in Golden, Colorado. Back then, they called their hard candy “Famous for Flavor. ”Today, Jolly Rancher Hard Candy is still famous for its untamed fruit flavors. You can also enjoy Jolly Rancher Lollipops, Jelly Beans, Fruit Chews, and other products. Try them all, and find your favorite! Flavors include Watermelon, Apple, Orange, and Cherry.